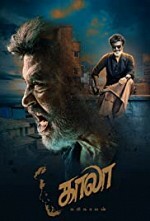 Watch Kaala: Union minister Haridev called as "Hari Dhadha" Abhayankar, previously a gangster who had carried out many attacks in Dharavi, tries to evict the people and seize their land. Kaala, the leader of Dharavi, opposes it to protect the area and his people. Hari Dhadha's failed attempts to kill Kaala in order to take control of the area leads to the death of Kaala's wife and older son instead. And to take revenge on him and protect the people of Dharavi, Kaala decides to fight him.